PS I am still waiting to see what the deal will be with the oil coolers you are developing! Great timing. I'm building a couple of them as we speak. One for a guy that called me out of the blue and one to list in general. I've had a few of them "in service" for a while now with very positive results. The first is the one on my bike. I can fire it up and let it idle endlessly on the hottest of days and the oil temp will come up to 180° and the thermostat starts to open; at 190°, the thermostat is fully open, and it doesn't climb another degree. Ever (at ide). That doesn't mean that my oil temp never gets above 190°, as it does go up on long freeway runs at high speeds (85 mph), but it now gets up to about 225° whereas without the cooler it would see 250° - 270° on a regular basis. The second is on my friend Mike's bike in Virginia (username bcnasty on some forums). He's had it for a couple of summers I think and reports a 20° drop in oil temp during parade duty. The third one is on my friend John's bike down in Marengo, IL. 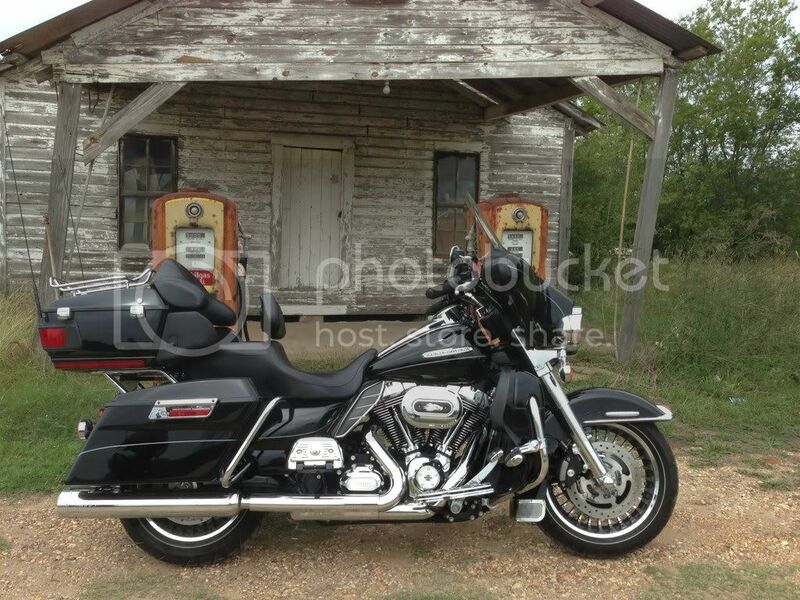 He's got an '07 CVO Ultra with the notoriously hot running 110" and he has a bunch of extra hotrod work in it as well. His bike came with the H-D Premium Oil Cooler installed, and he said it was "okay" going down the road, but would cook him in stop n' go Chicago traffic. We installed one of my coolers in conjunction with the cooler already in place (no reason not to) and he says all is now well. He's way happy with it. The bottom line is that it flat-out works. It has to... it's gigantic. It is not as efficient as a traditional tube/fin configuration when going down the road at freeway speeds but it will cool sitting dead still at idle or in stop n' go traffic where a traditional tube/fin fails miserably. And it can be run in conjunction with a traditional cooler with no hassles. I should have had these things listed for some time now but in the past couple of months I've finalized remote filter kits for '09 and up Touring bikes, remote filter kits for Softails and clamp-on universals for 1" od frame tubes with clamp-ons for 1-1/8" od frame tubes coming in the next few days. I've been a very busy boy. Wow....how much oil does that add to the system? Also, with it setting way back there...Is some kind of secondary (maybe electric?) oil pump required? Finally...any idea what it's going to cost yet? I really like that it is doable with the HD Premium oil cooler simultaneously. Also, with my 2 into 1 exhaust on my 09 ultra...there is a spot open for it under my left saddlebag!!! With the remote filter and the cooler, capacity is increased by about a quart. The heat exchanger holds 20 ounces and the rest of it holds 10 to 12 ounces more. The location is no problem. Our Gerotor type oil pumps are what's known as "positive displacement" type pumps, meaning that unless physically broken they WILL move x amount of oil per revolution. I had one of HTT's finest "armchair engineers" try to argue the point with me so I plumbed 40' (yes, that's forty feet) of extra hose in mine and took video showing that the oil pressure didn't drop a bit. Retail is $199.99 when used with my remote filter at 179.99 (379.98 total) but I do 15% off for members here which would be $322.99 + actual shipping. It could be run without the remote filter but it would seem rather pointless to me. The hoses would be right there, why not remote mount the filter and save all the headaches when changing the filter. You wouldn't need my thermostatic adapter but you would need the longer hoses that come with the remote filter kit and you'd need the frame bracket/clamp that routes the hoses nicely along the frame rail so the price would still be the $199.99 (169.99 member price). On the bike with both coolers, we ran it with both thermostatic adapters in place as it simplifies the plumbing quite a bit and of course he never has to go anywhere near the H-D adapter when changing the filter (I'm sure you're well aware of how much "fun" that can be). We looked at it 6 ways from Sunday and I'm convinced that this was the best way to go. Like all of my stuff, it comes as a complete kit with every nut, bolt, washer, zip-tie, etc, needed to install it in less than an hour with only simple hand tools. I take a lot of pride in that part. No trips to the dealership or the hardware store. All you supply is the oil and the filter itself. I can't buy filters any cheaper than you can so there's no point in adding weight to the package and driving up the shipping cost. Sorry for the novel but it's a lot of information to convey. Last edited by Big Dan; 04-16-2013 at 08:12 PM. "We should not categorize ourselves by race but as Americans! Our Wars we have fought as Brothers has sealed that in Blood on the Battlefields"
Spray with penetrating oil and let soak overnight. If you can get the nozzle down between the disks and closer to the threads that's even better. Use plenty of anti-seize when re-installing or installing new screws. If the heads snap off of some of them, removing the broken ones should be easy enough. Once you pull the disks off there's plenty left of the broken screws to grab with a vise-grips and they'll no longer be tensioned. I've been through this many times and it has always played out the same way (on those where some have snapped the heads off). Sometimes none snap. Of course, as always, your mileage may vary. Also, when you put the muffler back on, grease the outside of the headerpipe that you slide the muffler over with some antisieze compound. 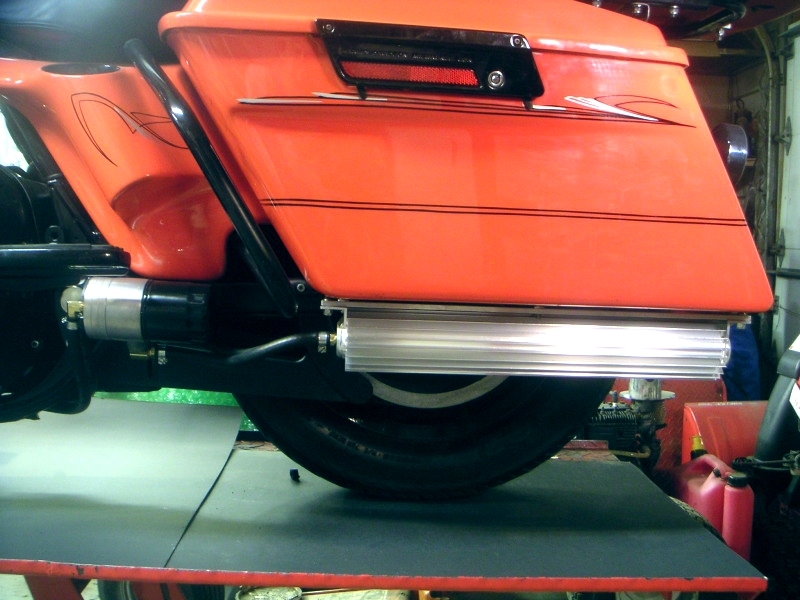 After the muffler clamp has been reinstalled, wipe off any antisieze that may have squeezed out from under the joint before moving on and reinstalling your heat shields. Antisieze compound is a critical step in ANY exhaust component joint, nut, screw or bolt that you may ever need to remove again. Arghhhhh some of my bolts have sheared on the baffle plates, I know they are 10-24x2" but do you think I can find them !!!! The local dealer wants £20 for 6 bolts that's a rip off but no where near as bad as £28 shipping from the USA . And whenever you put the bolts back in any exhaust. You HAVE to use Anti Seize on the threads. When I pull the mufflers off the header pipes. I put anti Seize on the inside part of the muffler. So when I go to Pull it back apart it will come apart.